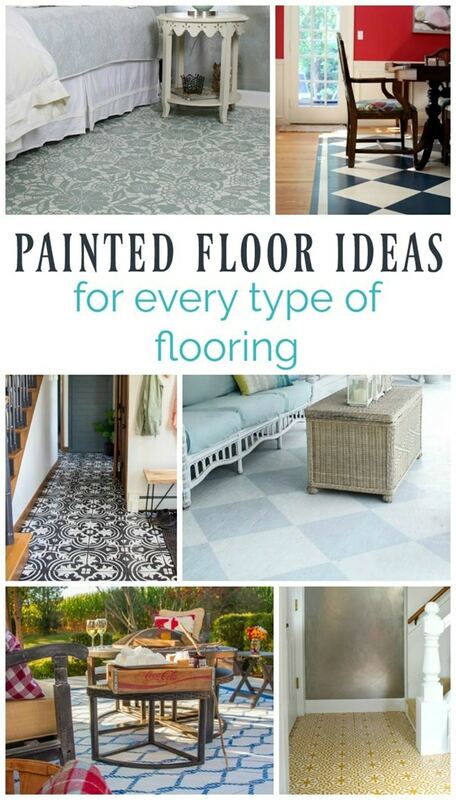 15 Gorgeous Painted Floors: Ideas for Every Type of Flooring - Lovely Etc. Several years ago I was wracking my brain, trying to figure out a way to replace our nasty carpet without spending a lot of money. I came up with the solution of painting our plywood subfloors and it was brilliant! They were beautiful, easy enough to DIY, and incredibly inexpensive. Since then I’ve been seeing painted floors everywhere: painted subfloors, hardwoods, tile, concrete, vinyl, decks, pretty much any type of hard flooring can be painted. I’ve seen so many gorgeous ideas, I just had to pull them together to share with you guys. You can click any picture below to be taken to the original blog for more pics, info, and tutorials. I absolutely love hardwoods and I think they are beautiful, even when they are scuffed and scratched. But if your hardwoods are beyond saving, with mismatched boards or major stains, paint can be a great way to bring them back to life! Deborah at Salvage Sister and Mister shared this pretty hardwood floor painted white. 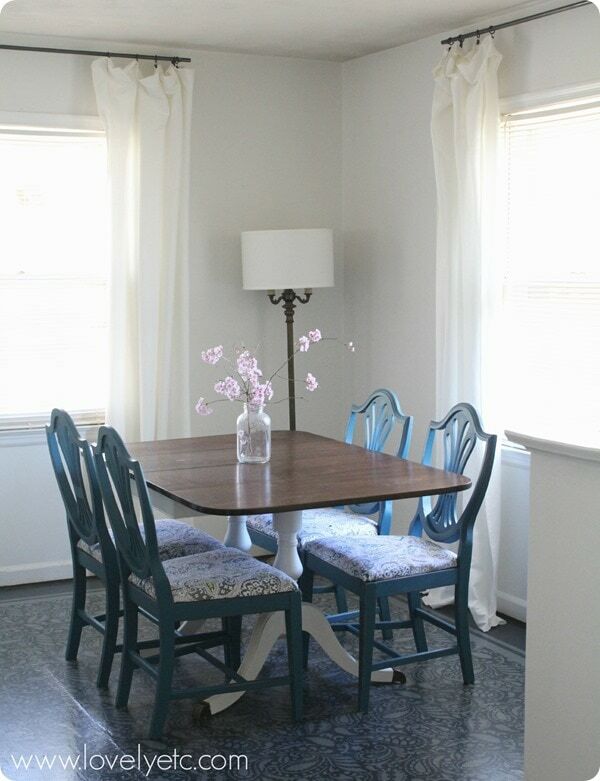 Jillian and Drew at The Brick Nests had a big faded spot on their hardwoods where a rug used to be. Their brilliant solution: paint a rug in the same spot. Jessica at Petal and Ply fixed the damaged wood floors in her entry with a beautiful stencil. When Pam at Clever Little Mouse pulled up the carpet in her craft room, she found hardwoods in all different widths and colors. She unified her mismatched flooring with a fresh coat of paint. When the carpet has to go, painting the plywood subfloor underneath can be a lifesaver. Painting subfloors might sound pretty nontraditional, but I can attest to the fact it can look beautiful. 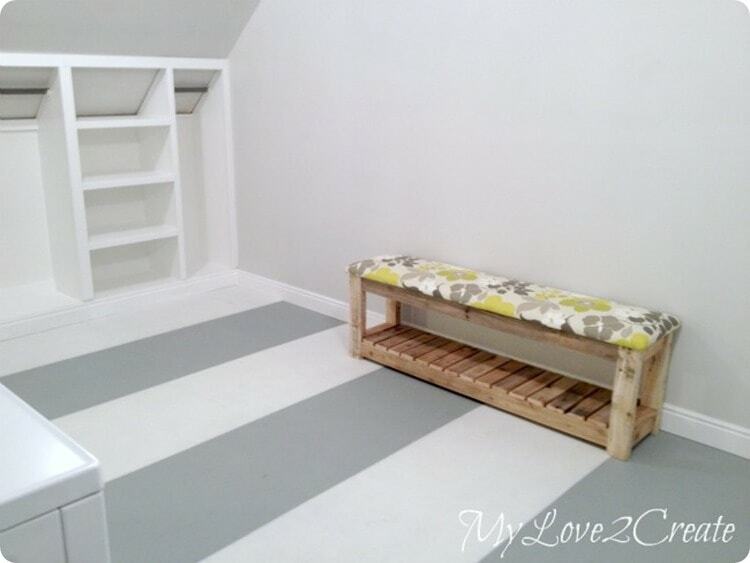 Mindi at My Love 2 Create painted these gorgeous wide stripes on her sister’s plywood subfloor. These are my own painted plywood subfloors – such an improvement over the stained carpet that was there before! Replacing dated tile is a huge project that requires either lots of work or lots of money…or both. 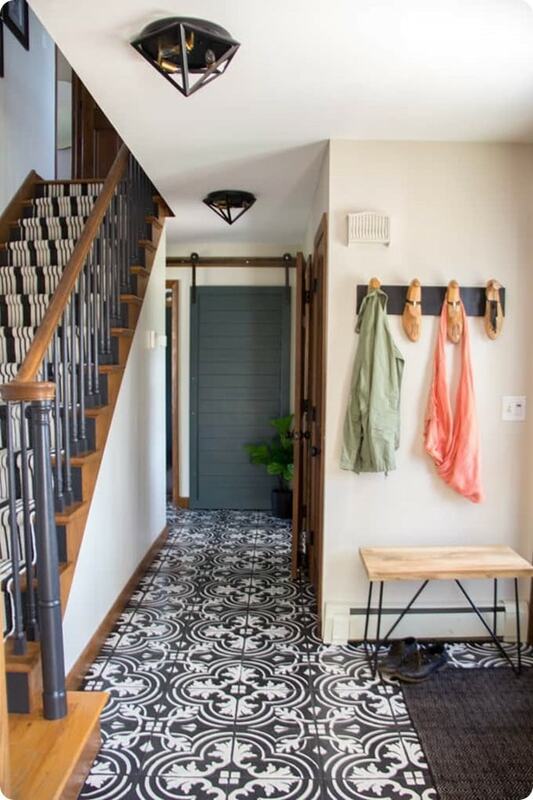 I love the idea of giving tile a brand new look with paint instead. 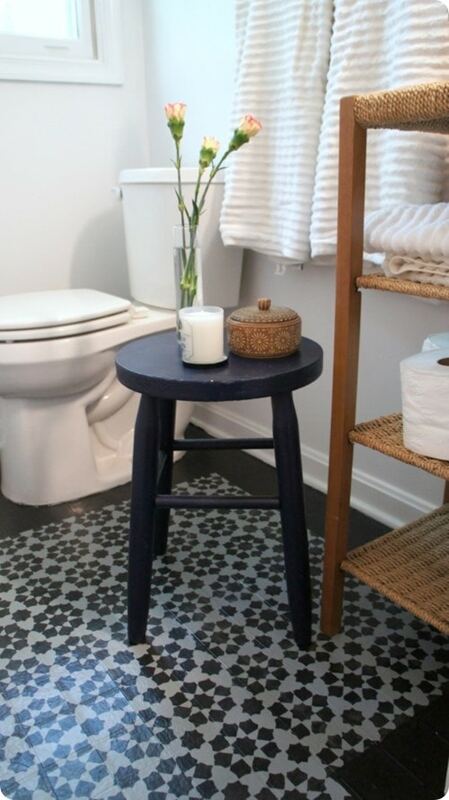 Jess from Bright Green Door painted her blah tile to look like beautiful cement tile using a custom stencil. Yuni from Love Your Abode painted and stenciled her bathroom tiles. 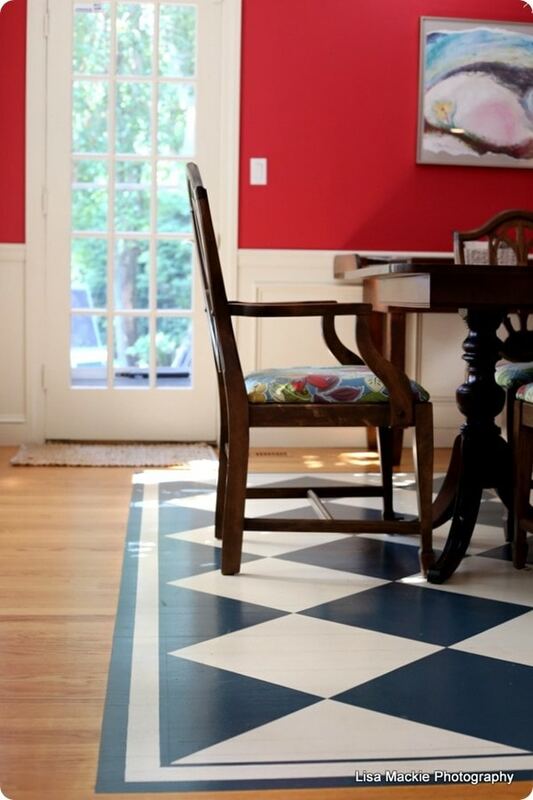 Even vinyl floors can be updated with paint. Seriously, you can paint almost anything! 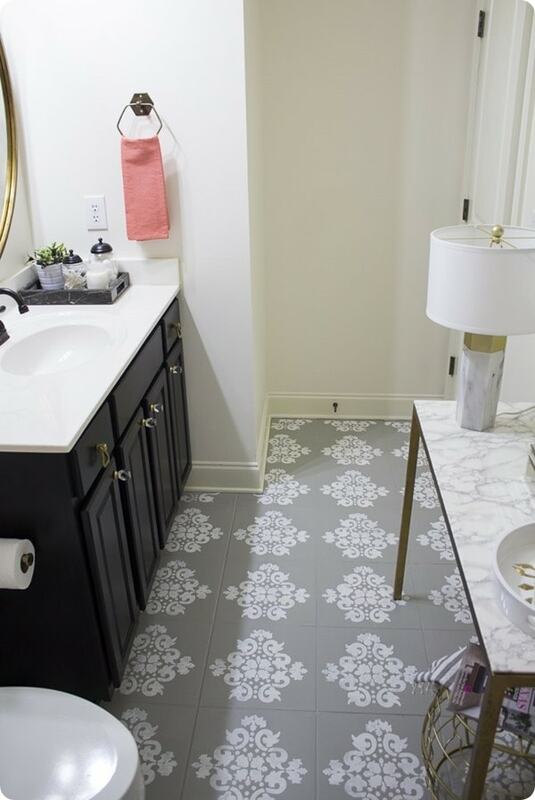 Emy from Semigloss Designs painted the ugly vinyl floor in her bathroom. Plus she has an update on how the paint job was holding up a year later. Concrete floors are nice and smooth and make the perfect surface for a fresh coat of paint. 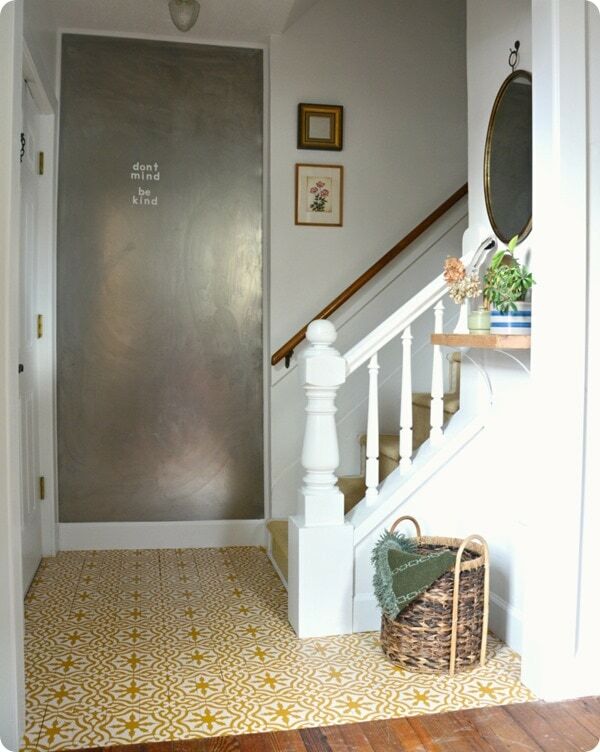 Sara from Twelve on Main updated her concrete subfloor using a homemade stencil. 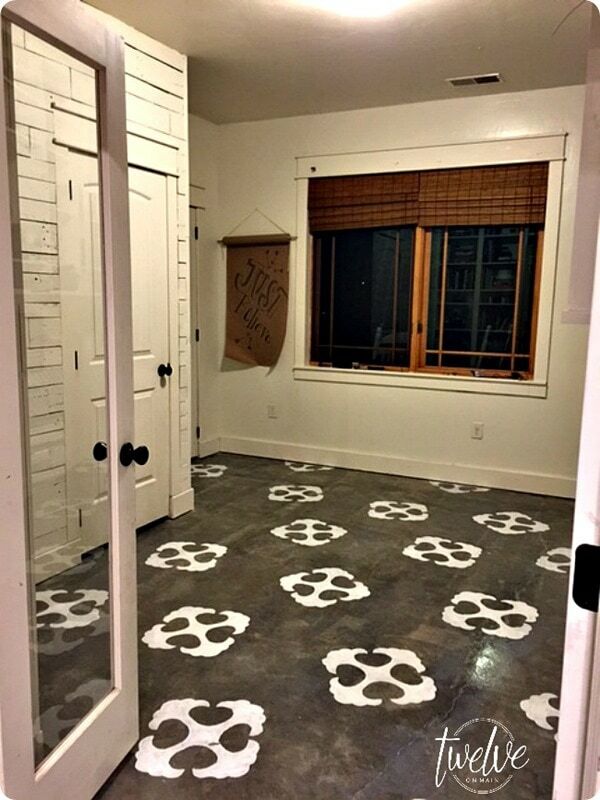 Brooks and Dana from Bella Tucker used a stencil and Annie Sloan Chalk Paint to update their concrete subfloors. 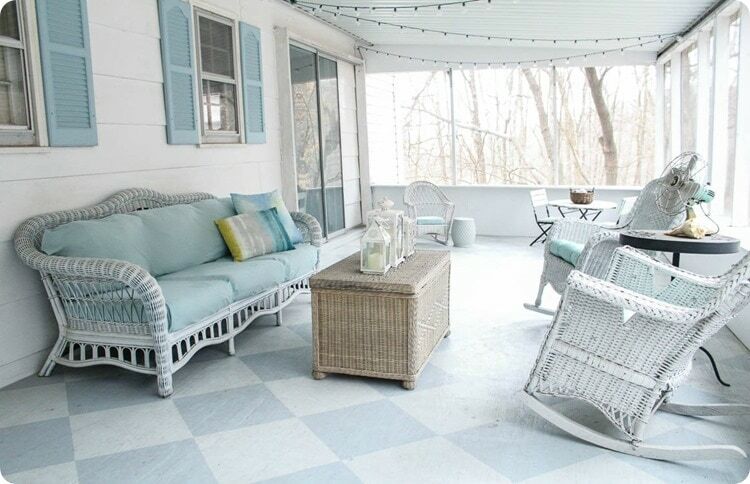 Painted floors even work for outdoor spaces. If you really think about it, porches have had painted wood floors for years and you can also paint concrete porches, concrete patios, even wood decks. 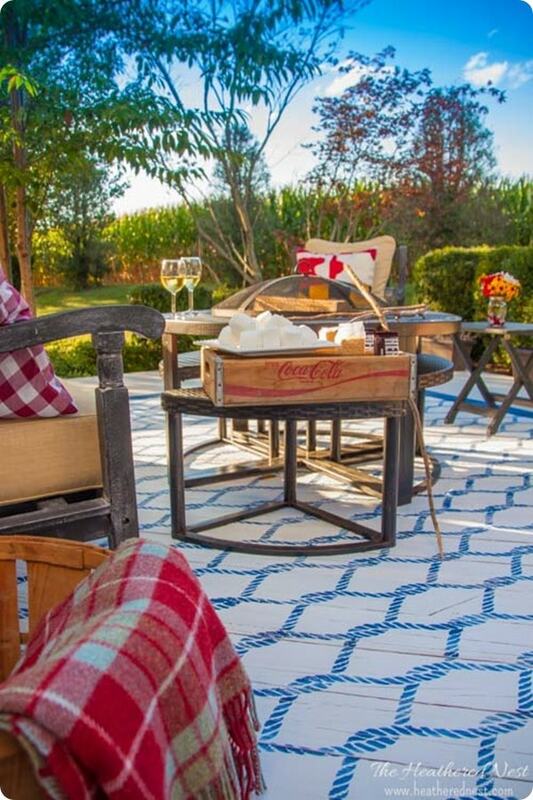 Heather from the Heathered Nest stenciled this beautiful rug on her wood deck. 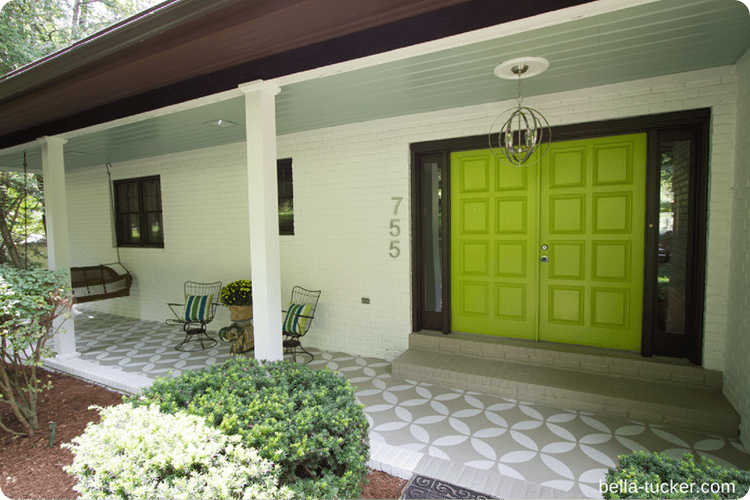 This modern stenciled concrete porch is another great painted floor from Brooks and Dana of Bella Tucker. 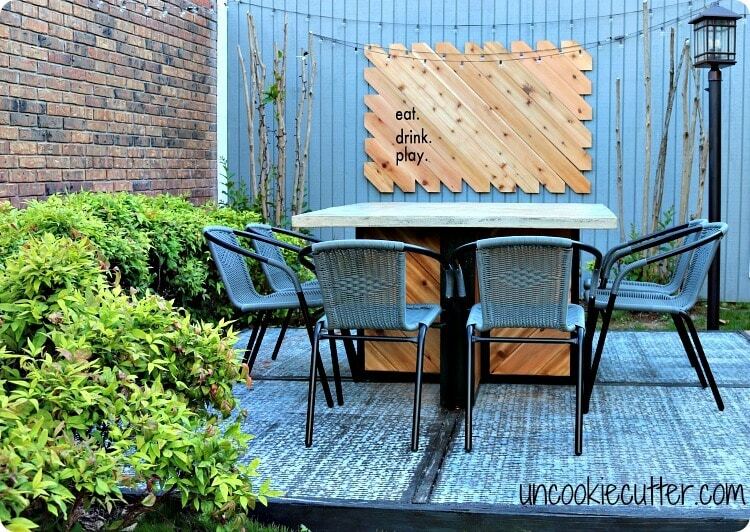 April from Uncookie Cutter painted this beautiful rug on her concrete patio. 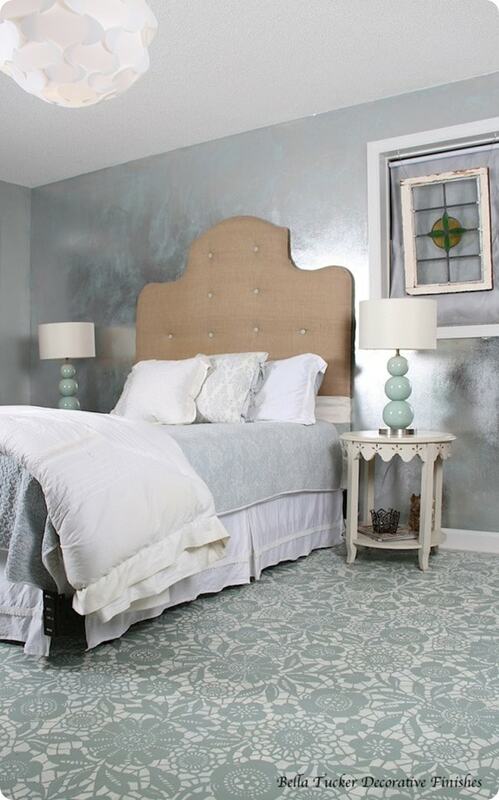 It’s amazing how much texture this painted rug appears to have. This is my own painted plywood floor on my screened porch. I love this classic diamond pattern. Perfect timing on this post! 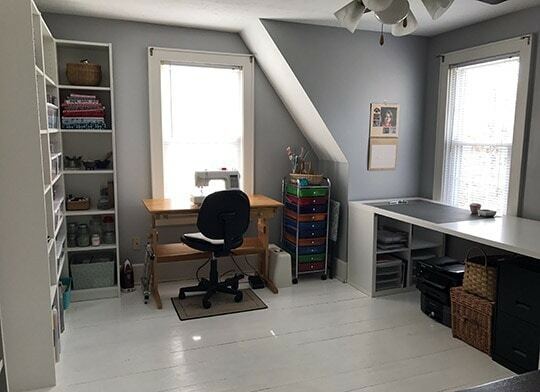 I’ve loved your painted floor for a long time and finally will be doing my home office floor in the next month! I’ve got all my supplies and am ready to go. Plus Frog Tape is sponsoring the post so that makes it even more fun! Oh good! Good luck with your floor painting. And my husband is the same way – there’s always lots of moaning and side eye until it’s all done and looking awesome! Yay for tearing up carpet! It really is gross all the dust and debris that lurks under our carpets, lol!